Are there really any differences when it comes to racing in Europe & America? 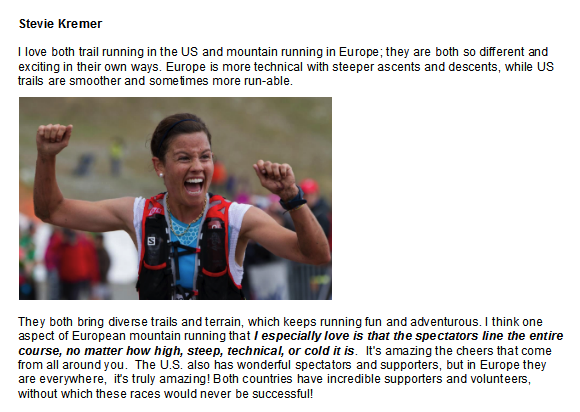 Runners from both sides of the Atlantic have their say about trail running on both continents. When Michel Poletti, president of ITRA, spoke recently at the presentation of the Spain Ultra Cup about what type of international race organizations would de targeted for future membership, he affirmed that the ITRA would be particularly hoping to attract “organisations with long-distance races taking place in natural scenery“. Although this definition may sound a little vague, it is in fact quite difficult to find a common denominator that might aptly describre races taking place on both sides of the Atlantic. Are we talking about the same kind of race on both continents? It doesn’t seem that way from what some of our top runners have to say. In any case, surely the “variations on a theme” are what make this sport so appealing, right? 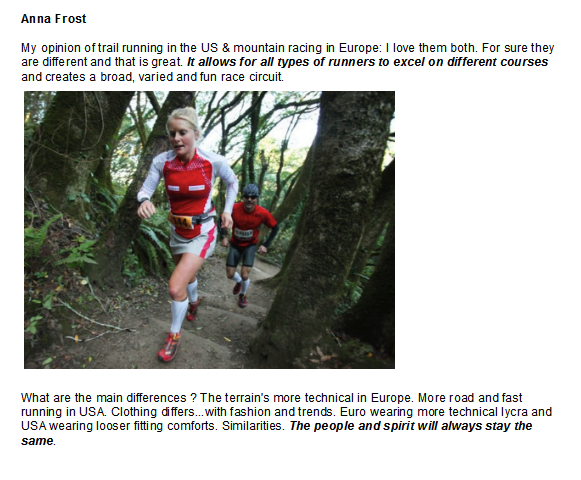 What are the differences anyway, between trail running & mountain running? 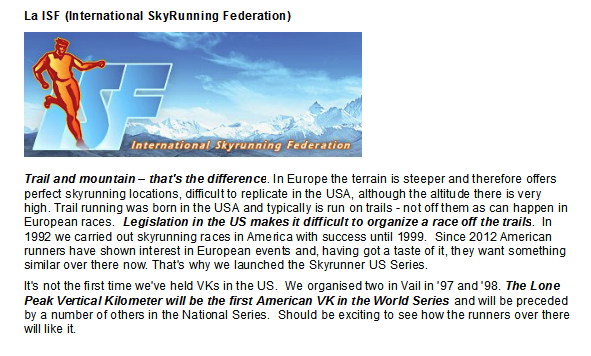 According to the ISF, “The difference lies in the terminology itself: trail & montain“. The main difference, which everyone seems to agree on, is the greater technical difficulty of races in Europe and the faster speed of races run in the US. 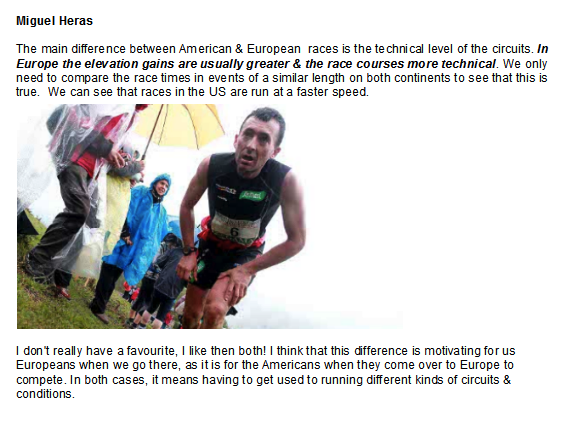 As Tòfol Castanyer points out, this means that“American races are more runnable” suggesting that faster ultra-distance racers have the advantage, as opposed to mountain running specialists. This difference has already been discussed in our article in Spanish, la diferencia entre trail running, fell running y carrera de montaña. In the US the sport is called “trail running“, whereas in Europe, terms such asmountain running, skyrunning or fell running (UK) are used. The term “trail running” obviously refers to the kind of track or path followed, whereas in Europe it’s all about “mountains“. Whereas “trail running” doesn’t necessarily imply elevation gains. “In Europe the elevation gains are usually greater“says Miguel Heras,“I think that this difference is motivating for us Europeans when we go there, as it is for the Americans when they come over to Europe to compete. 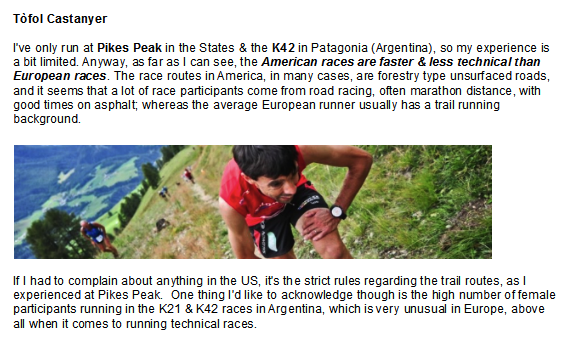 Many of the races held in the US run through national parks, which follow a stricter legislation than we’re used to in Europe, regarding how hikers & runners should use the footpaths or trails. All these measures are imposed with the greater benefit of protecting the lanscape & natural habitat of the species found in the parks. This means that anyone wondering off the trail will be sanctioned (usually with disqualification), something that Europeans are simply not used to. 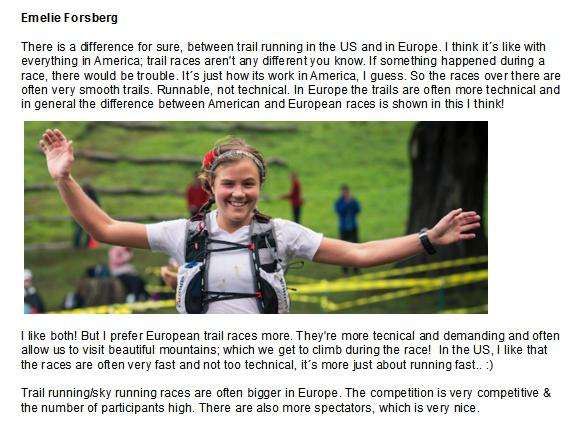 As Emelie Forsberg jokes, “I think it´s like with everything in America; trail races aren’t any different you know“. Rules are rules! In Europe, things are very different, where, in most cases,the race course simply follows the most direct route across the mountain. “In Scotland“, for example, says Andy Symonds,” the hills are steep, there are great open spaces without trees, there is grass and bog all over the place. The result is that fell races go straight through fields and up and down hills. Race routes are driven by the shortest lines rather than by path networks”. 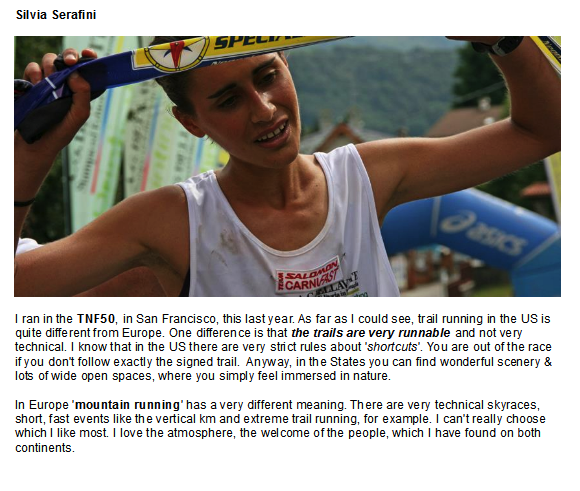 Consecuently, European trail runners find that they have to change their whole approach to racing, as Silvia Serafini states, “I know that in the US there are very strict rules about ‘shortcuts‘. You are out of the race if you don’t follow exactly the signed trail“. Kilian Jornet can testify to this, as he was stripped of his prize money and course record, in last year’s Speedgoat 50k for cutting switchbacks. So what’s Dakota Jones take on the subject? He interestingly points out that “ In America, trail running came out of a culture of hiking and mountain climbing that has its roots in solitude and escape“. 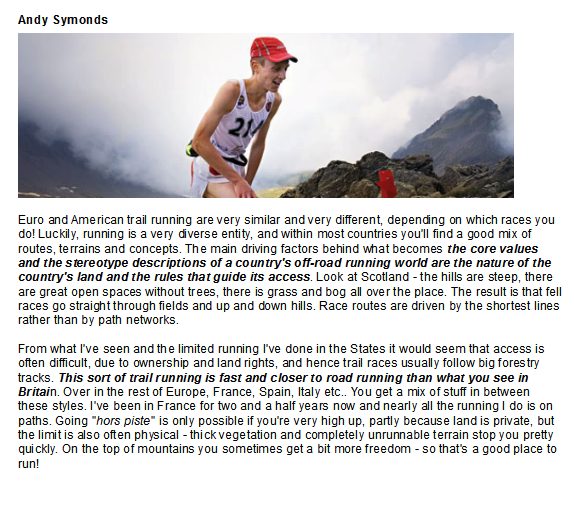 Whereas, “Europeans accept mountain running more and are allowed to have more people in their races, so the scene is much more professional than anywhere else”. ” When Americans race, they are almost afraid to say they are racing, because they don’t want to betray traditional values about the purity of the sport“. In an episode of Kilian´s Quest we can see how the young Catalonian runner meets up with running legend, Pablo Vigil. It’s interesting to compare how the two are dressed; Kilian with his specialized gear –Suunto GPS heart rate monitor, Salomon technical shorts & training shoes, while Pablo Vigilcan be found wearing the traditional runners sorts and a pair of Nike road trainers. Although this is a simple anecdote, it does undeline the point that, in general, European runners seem to get moredressed up for the occasion! Anna Frost comments that “Clothing differs…with fashion and trends. Euro wearing more technical lycra and USA wearing looser fitting comforts. 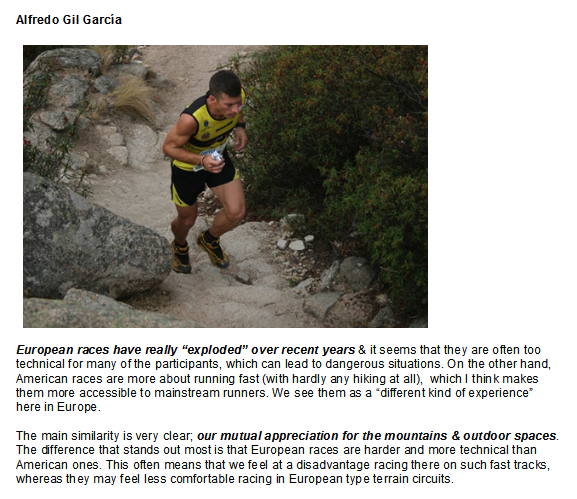 There seems to be a common agreement among runners that there is one characteristic to be found on both sides of the Atlantic: the spirit of running, be it trail running in the US or fell running (UK), mountain running or skyrunning in Europe, “our mutual appreciation for the mountains & outdoor spaces”, says Alfredo Gil, Spain’s national champion. “I think we all have that in common“. It seems that, as more and more runners make the jump, from one continent to another, things are changing. 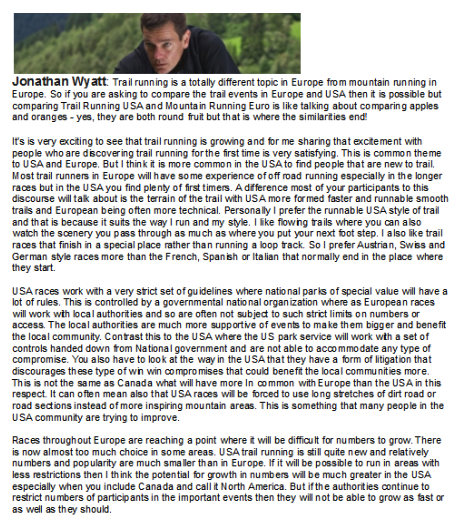 As Jonathan Wyatt observes, ” We see a lot of North American runners who have learnt a lot from the European style of trail running and they are excited to bring some of these elements to North America including the more technical running trails“. Finally, let’s just remember the words of Silvia Serafini, who defines the atmosphere of our sport perfectly, “I can’t really choose which I like most, racing in America or in Europe. I love the atmosphere, the welcome of the people, which I have found on both continents“. It is reproduced with the full approval of corredordemontana.com and Nigel John Wilson and has not been altered or adjusted in anyway. The original article is available HERE should you wish to view it. This entry was posted in Uncategorized and tagged andy, anna, castanyer, corredordemontana.com, dakota, emelie, Europe, Forsberg, Frost, Heras, ISF, Itra, Jones, jono, Kremer, miguel, Mountain, Salomon, serafini, silvia, Skyrunning, Spain, stevire, symonds, tofol, trail, Trail running in America & mountain races in Europe, UK, Ultra, US, usa, UTWT, wyatt by talkultra. Bookmark the permalink. That is why I think Sébastien Chebneau was my ultra athlete of the year. He won on both sides of the pond. Timothy Olsen had a very busy year and scored high outside of the USA. Unfortunately the hype about Rob Krar still needs to be proven on more technical trails. Therefor hats off to Sage who is a speed demon, but packed a passport too….